Since my desk is down the hall from our glorious Who What Wear Collection closet, I’ll often find myself perusing the racks and picking up a sample or two to test out. 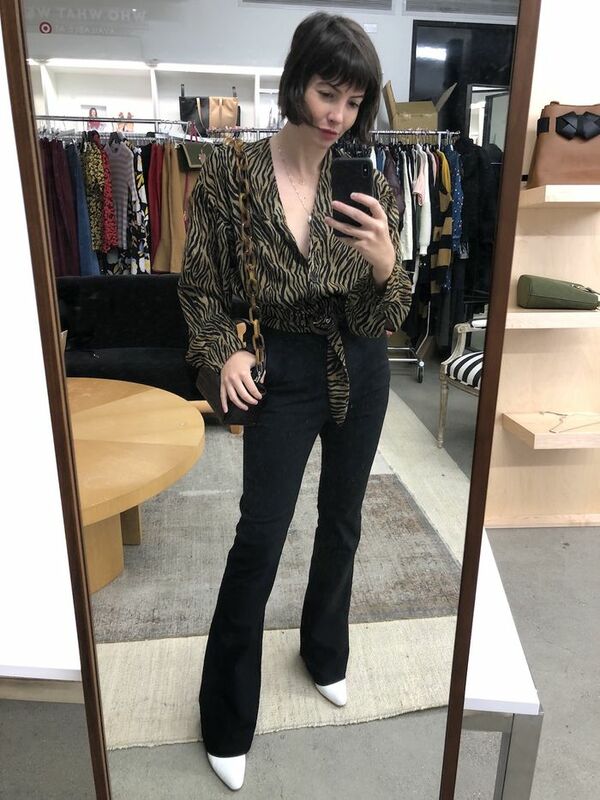 Normally, I don’t write about my finds (there are a couple of other editors who focus on coverage of our line), but the minute I tried these pants on, I knew I had to spread the good word. In fact, I ended up wearing the $33 pants for three days straight, much to my chagrin. I hope my boss didn’t notice then, but she definitely will know now (hi, Hillary!) The thing is, once I knew how good these pants felt on, everything else in my closet just seemed less appealing. Read on for my review on why this pair turned me into a pant evangelist. These pants are made of the same material as our skinny ankle pants, which have a cult following for a reason. We bring them back season after season in new colors because they’re so popular. They stretch so they’re almost as comfortable as leggings, but they hold shape and are thick enough that they qualify as a real trouser. It’s the best of both worlds, if you ask me. I find that bootcut pants are generally very flattering on me, as the flared bottoms provide a nice counterpoint to my hips. I personally found these made me look a lot trimmer than a lot of other pants I own. The rise is higher, which is a good match for my more cropped blouses. The inseam length definitely means that I have to wear heels with them. I’m 5’4’’ for reference, and didn’t have to tailor the hem when wearing them with 4’’ heels. The fact that I’m forced to wear heels with them adds to the leg-lengthening magic. There’s a little notch at the back of the waist. It’s a small detail, but it stands out when you tuck in a contrast color top. I also love that the flare of the pants isn’t too wide, as it feels much more modern than a wider bell. Next up, check out the pants that are replacing fashion girls’ jeans this fall.